I love yellow roses, so when I saw this pattern I knew the color scheme immediately. I am over the moon pleased with the outcome. I found this pattern in a 40% off basket on a trip to Chicago in 2008. Yes, I did the math and it only took 6 years to complete. I bought the fabric locally and started my adventure. Fortunately I was super organized about it and although it some times sat for years untouched, when I did bring it out I was able to pick up where I left off. This is a picture of my organized mess. I first became fascinated with paper piecing when I saw a very intricate quilt of a humming-bird. I was not a quilter back then, but I would go into the shop where it hung every few months or so just to look at it. Finally I asked how it was done and heard the term “paper piecing” for the first time. I never did purchase the pattern so when I saw this one for English Roses by Eileen Sullivan, I was not about to pass it by. The shop that displayed the humming-bird quilt is long gone. You can see this and other gorgeous paper pieced patterns here. Coming up with the quilting took longer than normal for me. Quilt tops talk to me. No, I am not the quilt whisperer. Sometime during the process, the quilting style comes to me. When this didn’t happen, I was stumped. I really wanted to keep the lines straight and not fight the angles of the piecing. Finally, it came to me. I was afraid to use some of the standby marking methods, so I went for painter’s tape. Pinning the tape turned out to be the key. It is difficult to see, but I put down the tape out in the opposite order of how it was quilted. 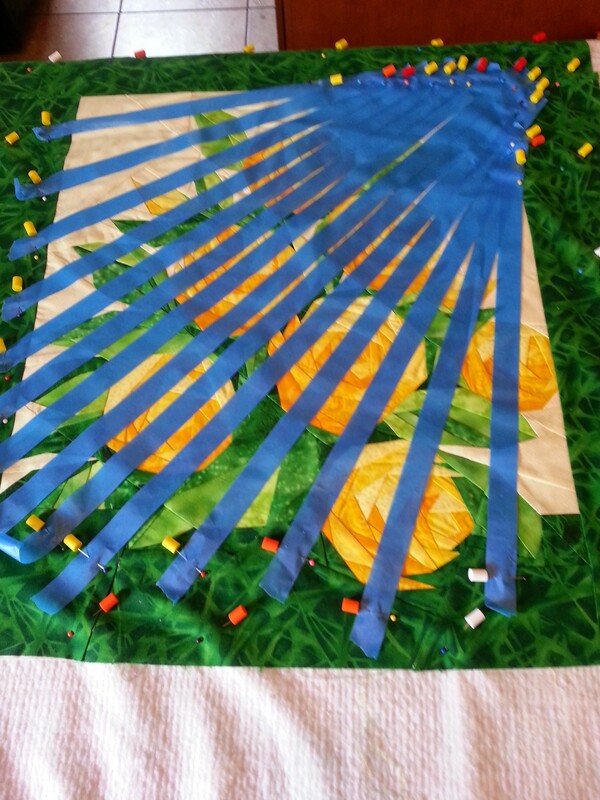 I would quilt a line, remove the tape and then quilt to the next line. I started on the far right. I really enjoyed the process and yes, I will definitely do this type of piecing again. 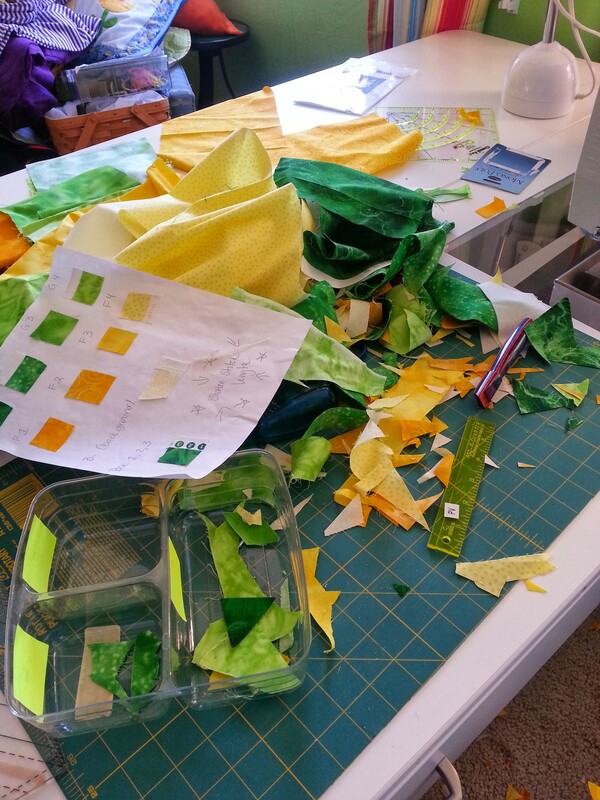 It requires staying somewhat organized, referring to a fabric chart constantly, and being focused. I can do that. Even in the midst of what most would call a mess, I could put my hands on everything I needed. Wow, another month done. This is actually the first UFO that I finished. The feeling of satisfaction is inspiring. So far I am 4 for 4. Now, if I could just be that focused on blogging. 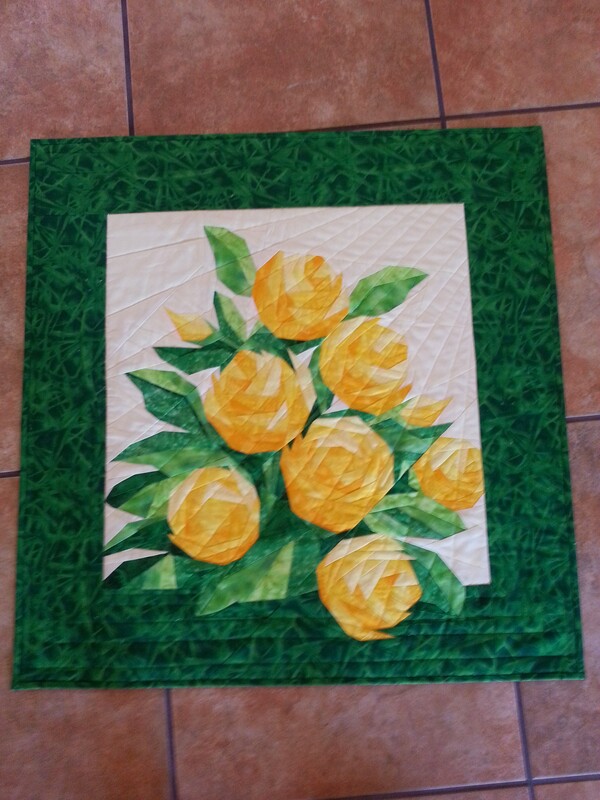 This entry was posted on April 30, 2014, in Quilting and tagged paper piecing, quilt, yellow roses. Bookmark the permalink.